Wake now, discover that you are the song that the morning brings." Winter is here, the beautiful hibernation time of year when we have an opportunity to rest in the arms of the Mother Earth. The light begins to return and the rains moisten our skin and soften us for what is to come next. With the fast pace of the world today, we tend to forget what it means to slow down, and winter is a great gift to remind us. We are the seed that is hidden in the darkness, drinking in the nutrients of our spirit, softening so that we can crack open for the growth of the next step on our path. It is a time to look at what we need to lift into the light. What are our qualities, our wisdom, our gifts that need to blossom. If we do not believe that our offer, the service we bring into the world, is “enough,” then our world will be lacking. Through our bodies, this amazing gift we have that lets us be right here right now, we add beautiful nutrients to the soil of our life. Our bodies give us the opportunity to touch, smell, taste, hear, and see not only what is outside of us, but also what is inside. And in this movie called life, we need to look inside of ourselves to see the bigger picture. 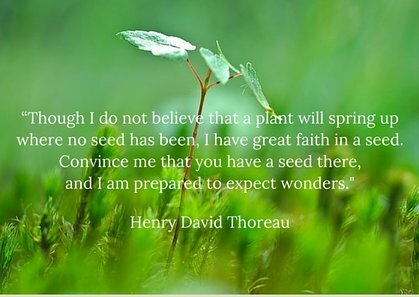 Dig deep into the archaeology of your life -- and become the seed. Extending toward the light is a recognition of the strength and courage that got you where you are today. Nourish your life; you are worth it. I offer you this meditation below to enhance the journey of embodying who we really are. Your gaze falls on a figure moving toward you. You reach out your hand to your spirit guide and feel their hand take yours as you move into their essence. As you stand before your guide, you place your hand on their heart and they place their hand on yours, looking deeply into the space that connects you both. Between you appears a sacred object. You take that object and hold it in your hands, feeling the sensation, the color, the texture, the source. See if it speaks to you. Ask if there is a teaching for you, opening yourself to whatever may come in sensation or story. Remember, that this object represents your greatest offer, your gifts to the world. You place the object deeply into your heart and thank your spirit guide, as you slowly step back into the present moment. Wishing you all a beautiful winter solstice.